Ceylinco Life’s globetrotting ‘Family Savari’ promotion is to venture south of the equator for the first time, giving lucky policyholders an opportunity to enjoy the magic of the Land Down Under in the first half of next year. 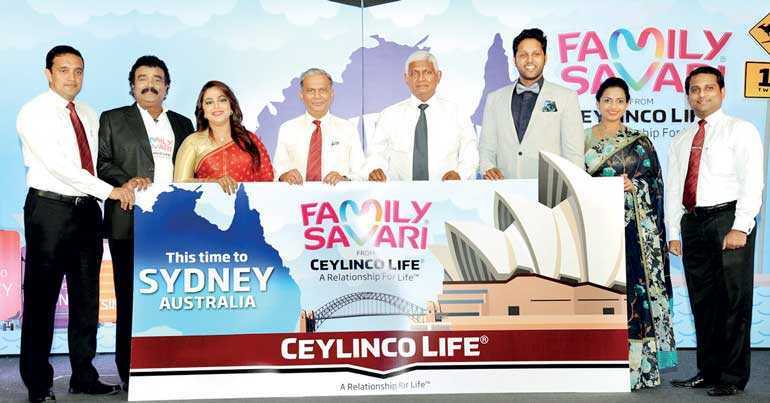 The life insurance leader has announced that Sydney, the most populous city in Australia and Oceania, will be the grand prize destination of the 12th edition of the Ceylinco Life Family Savari promotion, which kicked off on 1 September. Five policyholders and their families who win this prize will be accorded an all-expenses-paid holiday in the city known for its iconic opera house and harbour bridge. Grand prizewinning families at previous Family Savari promotions have visited Italy, England, Germany, Switzerland, Japan and France. In all, nearly 24,000 people have been rewarded with the Family Savari experience over the past 11 years. Easily the largest customer promotion in Sri Lanka’s life insurance sector, the latest edition of Ceylinco Life Family Savari will benefit 2,260 people from 565 policyholder families, with 65 families winning overseas holidays – 50 families to Singapore, 10 families to China and five to Sydney – and 500 families spending a day at the Leisure World theme park. Additionally, Ceylinco Life has announced that this year, 15 policyholder families drawn from customers that purchase new policies between 1 September and 31 December 2018 will each win a hotel stay in Sri Lanka through 15 weekly draws to be conducted during the promotion period. Conducted annually since 2006, the Ceylinco Life Family Savari promotion is intended to increase the penetration of life insurance and reward policyholders for keeping their policies active. All active long-term Ceylinco Life policyholders, holders of Ceylinco Life Retirement Plans and new policyholders who purchase a policy, pay three months’ premium and keep their policies active are eligible to win these holidays. Depending on the size of their policies or the balances in their retirement plans, some policyholders will be eligible to qualify for the draws for all four categories of prizes. The grand draw for Family Savari 12 will take place in January 2019, the company said. Ceylinco Life’s Family Savari program is promoted by four popular brand ambassadors, Sri Lankan actors Sriyantha Mendis, Sanjeewani Weerasinghe and Roshan Ranawana and his wife Kushlani who join policyholders on their overseas holidays and local excursions.